I recently had a chance to experiment with making digital negatives and using them for contact printing with platinum/palladium emulsions. Above is a quick scan of one of the images, to give you some idea of what one looks like - although it does not do justice to the final print. This was something I've been wanting to experiment with since I first heard about using imagesetters for this purpose, but just never got to it. Recently, Ron Reeder taught a workshop on the subject at Photographic Center Northwest, so I couldn't resist any longer. Given my background in digital printing and photography in general, it was an easy way to build on both of these experiences and create something new. The workshop itself was two days long - the first day covering the theory and calibration process, the second day generating negatives and printing them. This negative is then used to make contact prints in the wet lab. For this workshop, we were using hand-applied emulsion that's sensitive to UV light - approximately 5 minute exposures, then "developed" and "cleared". This process is using chemicals I'm not used to handling in the darkroom, but which are not particularly noxious or otherwise dangerous to handle. The result after washing is an archival print, with all the smooth gradations that only a contact print makes easy, perhaps slightly soft but not in a bad way. 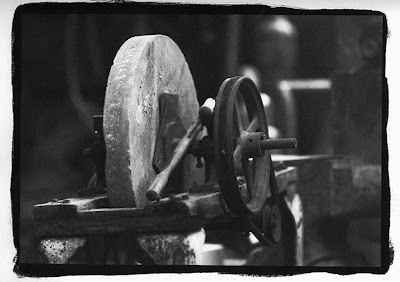 This same technique can be applied to other historical and modern printing processes, cyanotypes and albumen prints are something I'd like to try, and even modern silver gelatin prints can be created, with some variations. I'll probably experiment with silver a bit first, because I have to build UV light box in order to work with many of the other techniques. A good starting point for this technology, as well as some wonderful images created using it, are available at Ron Reeder's, site.